Like all other Social networks, StumbleUpon has also got some really elegant sharing buttons. StumbleUpon has got 6 different sharing buttons. You can choose any of these six. Integrating this into your blogger blog will require some template Edits. How to add the Stumble Upon Counter Button to Blogger? 1. First of all pick one of these 6 Button Styles. 3. Look for <data:post.body/> and immediately above it paste the following code. 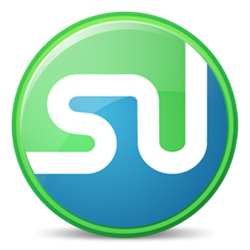 4.Save the Template and you will see a vertical Stumbleupon counter(style 5) on your post. In the code above, you can change s=5 to s=1 or s=2 or s=3 or s=4 or s=6 to get the other button styles. 5. If you need the counter on every page, then remove the two lines of code in Green Color. Thanks....now it is working! I just changed its placement from right to left. Wow! great! I like the way you have all four button arranged off to the right of the post title. Very clean and convenient. Agreed! I would love to see a post on how to arrange the various float counters! How did you make your stumble upon button go below the FB and Twitter Buttons? The button does not show up. Will it only appear on new posts?